Valentine's Day, 1900, and a party of girls from Miss Appleyard's College for Young Ladies are excitedly preparing for the annual school picnic. Their destination is Hanging Rock, and with permission to remove their gloves and strict warnings against any exploration of the Rock they set out on the hot and dusty three and a half hour drive to their destination. "While they were talking the angle of vision had gradually altered to bring the Hanging Rock into sudden startling view. Directly ahead, the grey volcanic mass rose up slabbed and pinnacled like a fortress from the empty, yellow plain. The three girls on the box seat could see the vertical lines of the rocky walls, now and then gashed with indigo shade, patches of grey green dogwood, outcrops of boulders even at this distance immense and formidable." After their lunch at the picnic grounds the girls settle down to amuse themselves for the afternoon with suitable activities like sewing and drawing. Knowing they have an essay to write next day four of the girls decide to walk closer to the base of the rock and are seen by two young men jumping the creek. Some time later an incoherent and screaming Edith emerges from the bush alone and there is a sudden realisation that one of the teachers has also disappeared. A massive search is undertaken in the following days without success until Mike and Albert, the last to see the girls, set off on their own and find a bleeding and exhausted Irma. The other two girls and their teacher were never seen again and in the aftermath of the tragedy many lives were changed forever. 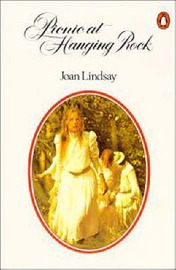 Picnic at Hanging Rock is a mystery with an eerie atmosphere and a strong sense of foreboding that makes compelling reading. "Insulated from natural contacts with earth, air and sunlight, by corsets pressing on the solar plexus, by voluminous petticoats, cotton stockings and kid boots, the drowsy, well-fed girls lounging in the shade were no more a part of their environment than figures in a photograph album, arbitrarily posed against a backcloth of cork rocks and cardboard trees." It's also a study of contrasts - of repression and control against what is natural. 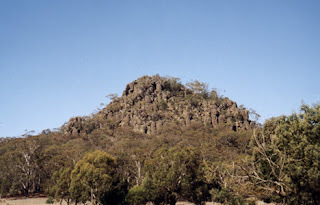 The geological marvel that is Hanging Rock as opposed to the oppressive and disciplinary Miss Appleyard and her school . 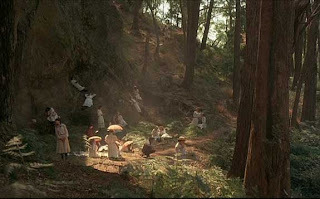 In the last glimpse of the missing girls they are rejoicing in their freedom, with no hats, shoes or stockings they dance on the rocks above the picnic grounds. The English settlers who bring the customs and attitudes of the mother country with them, whose thoughts are always on 'home', who struggle to plant pansies and petunias in a climate unsuitable for them to thrive have no interest in or understanding of the landscape surrounding them. Joan Lindsay achieves a great deal in only 186 pages and the story stays with one because nothing is ever resolved and the reader is left to make their own conclusions. The author had written a last chapter but in a mutual agreement between her and the publishers it was withdrawn when first published in 1967. In 1987 it was released and some later editions of the book include it - it can also be read online. I have no wish to - it's perfect as it is!.........without a solution. One of these days I will actually go to Hanging Rock. I've driven near it any number of times. I really enjoyed this when I read it a few years ago! It's a very atmospheric story and would make visiting Hanging Rock quite an experience, I imagine. Great overview of the book. I went to high school in Australia and remember this classic is very popular, but have never read it myself. It will definitely go on the list of to be read! I'm sure you would enjoy it - the descriptive prose gives a real sense of Australia. This is one of my childhood favourites - it gives me delicious shivers and goose bumps just thinking about it.